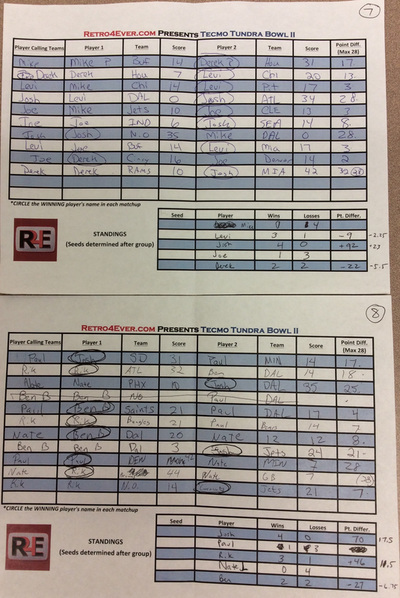 A solid turnout for Tundra Bowl I nearly doubled for Tundra Bowl II as we pulled in 49 competitors to square off in this annual competition, originally held Pro Bowl Saturday. With unprecedented local media coverage for a video game tournament, this year was the year we finally found ourselves on the map, so to speak. 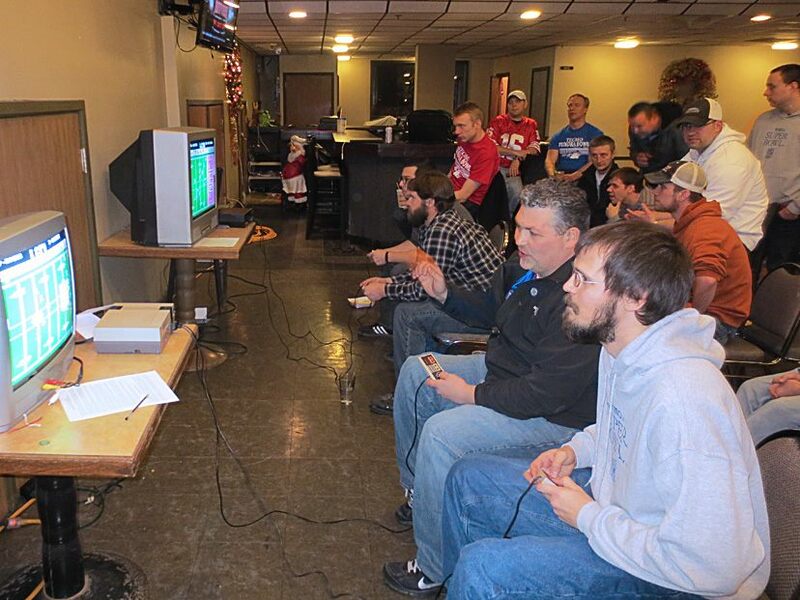 The Watering Hole once again played host to our Tundra Bowl tournament, and while the weather wasn't great, it didn't stop many travelers from other states from coming to play some Tecmo Super Bowl for a chance at cash prizes and a customized trophy. There were some big names on the Tecmo scene that were in the competition including the Rikster (rikfenny), Josh H. (sonofpatbeach), Josh A. (Coconuts), Troy H. (PrimeTime), Rico (ryanr33fulcher) and Jeff B., known as The Beard. ​Former Retro4Ever co-creator and tournament official Swagz got be in Group 1, on his famed black Nintendo console. He received this console for Christmas in 1985, and got to relive his memories through it for this Tundra Bowl. He was in a group with my fellow Niners fan, Matt A. (Flash80), and returning participants Rob C. (Faster Than a Speeding Beebe) and Quincy B. from Illinois. Unfortunately for Swagz, all three of those participants would manage to get out of Group Play, and were headed to the Tournament Bracket portion of our event. Group 2 had one of the tournament favorites, Rico, as well as some still competition as evidenced by three identical 2-2 records. Our R4E Crew member Kevin was in the group, and walked away 0-4. In no way does that reflect his lack of talent, but it shows exactly how difficult this group was to get out of. One 2-2 competitor from this group (Gio) didn't have enough of a point differential to get out of group play, but two others, Mike W. and Jay L. (HBK) were able to advance. 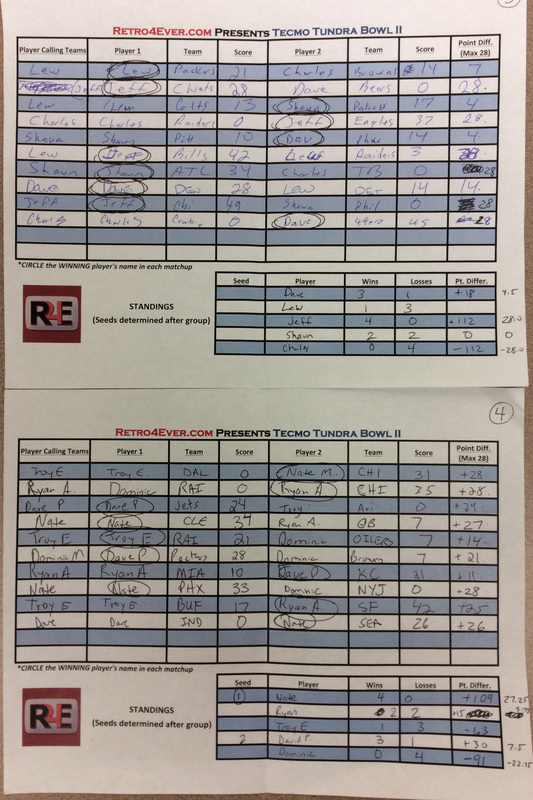 Group 3 saw The Beard go 4-0 and maximize his point differential (+28.0 PPG), and along with Dave N. advanced to Group Play. R4E Crew member Shaun B. was unable to get out of group play surprisingly this year. In my group, Group 4, I managed to nearly max out my point differential at +27.25 PPG, good enough for a #2 seed in the Tournament Bracket. Joining me from my group was David P. (Dpoosh) with a 3-1 record, and Ryan A. with a 2-2 record after Dave beat Ryan by 11 in an earlier game. Group 5 saw Troy (PrimeTime) lose a crucial matchup to Jesse D. (Slow N Sloppy), 20-14 with the Jets beating the Cardinals. Regardless of that result, both ended up in the Tournament Bracket, with Adam W. joining them. The heavy hitter from Group 6, Orenga (AverageTSBPlayer) dominated, taking a +18.75 PPG point differential into the Tournament Bracket, good for the #7 seed and a first-round bye. Will A. ended up at second-place spot in the group after a narrow loss to Orenga, 17-10. Group 7 had none other than the co-founder of Tecmo Madison, Josh H. He crusied through Group Play, securing the #3 overall seed in the bracket. Levi L., even with a negative PPG differential, nailed down the second-place finish in the group. Right next to them in Group 8 was Coconuts, who would go on to place second in Tecmo XI in Madison. He also beat the competition in his group to prevail as the group winner at 4-0. It wasn't without a fight though. Coconuts and the Rikster faced off in the final game of group play, where Rik called a Jets-Saints matchup. 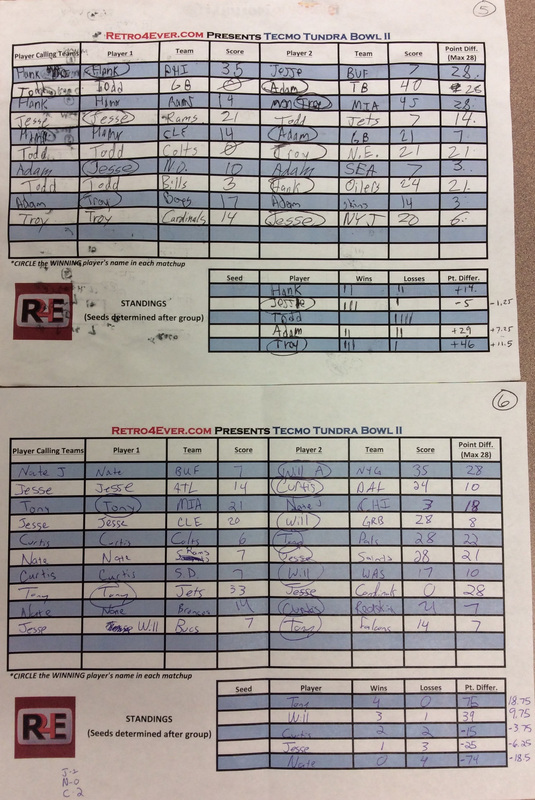 Josh managed to squeak one out with a 21-14 victory, sending Rik to the #11 seed overall. The Beard's good friend Lucas S. is a powerhouse in his own right. He headlined Group 9, and marched through the games with an impressive +20.75PPG point differential, good for the #5 seed. Zach H. (Attack) took the second-place spot in the group. Mike L. would take the 10th and final group, with Adam G. (Garbage) taking the #21 seed into the Bracket. Securing the top eight seeds was important because of the first round bye it provided. The first round of the Tournament Bracket had good friends Jay (HBK) and Quincy face off against each other. Jay managed to squeak out a close victory to move on in the bracket. 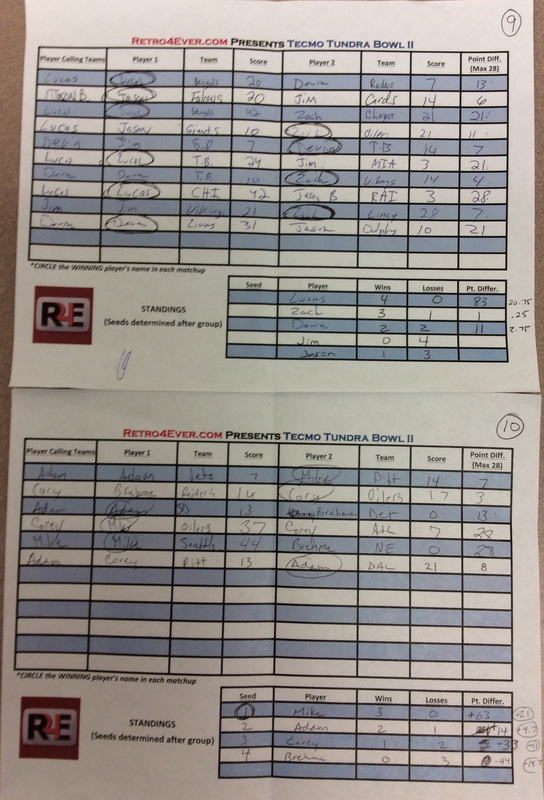 Another close games had Jesse beating R4E Crew member Adam W. by a score of 13-6, Tampa over San Diego. 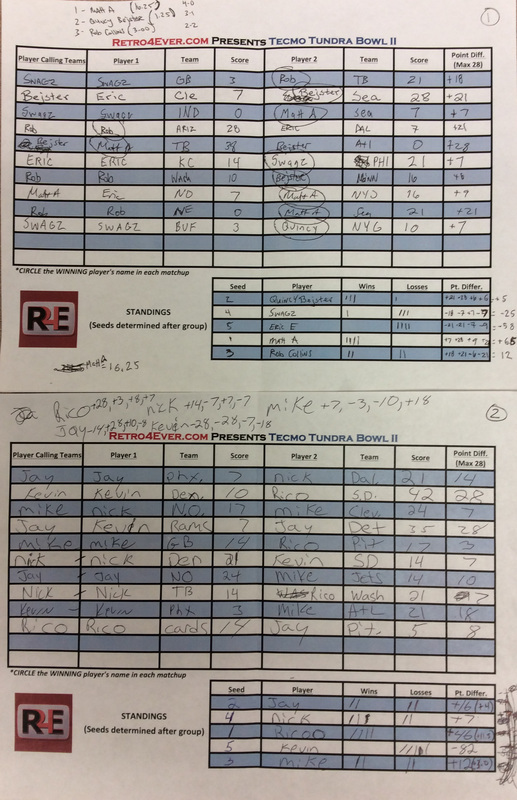 In other notable games, the Rikster moved on with a 13-10 victory, Rico won 31-17, PrimeTime rocked a 28-7 victory with the Rams over Denver, and both Garbage and Levi moved to Round 2 with wins. In the next Round, the top 8 seeds would play for the first time in the Tournament, and only three ended up being unscathed: Orenga, Josh H., and myself. Coconuts lost to the Rikster in a lopsided affair 31-7, Lucas lost to Garbage 24-3, and Rico beat Matt A. 21-10. The closest one is when Levi upset Mike 21-14, the Packers over the Browns. In the first round of the Loser's Bracket, the biggest upset and most shocking aspect was when Coconuts lost to Will 24-17 to put an end to his day. He had not practiced in the way he typically does, and vowed to never let that happen again. The tournament in Madison the very next month reflected that with his performance. Other notables included Quincy, PrimeTime, Jay, and Flash80 moving on in the tournament. 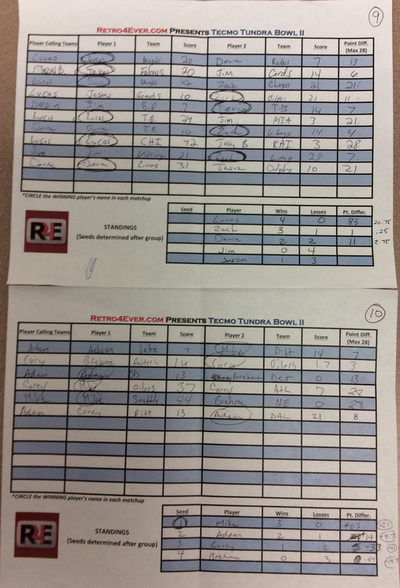 Adam W. lost his second straight, which left me as the last remaining member of the R4E Crew left. In Round 2 of the Loser's Bracket, there were two one-score games, with Quincy losing to PrimeTime 16-10, and HBK bouncing Matt A. in a close game, 10-6. 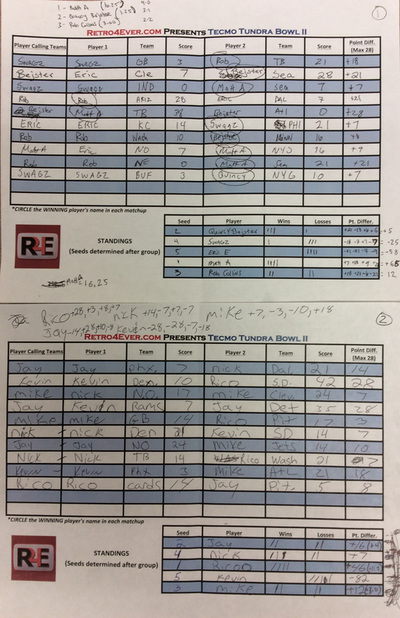 The other two games were blowouts as Will dominated Jesse 35-7 with the Broncos over the Dolphins and Lucas eliminating Mike L. with the Lions over the Vikings 35-0. ​Round 3 featured a lot of the recognizable Tecmo names facing off against one another. Jeff managed to cruise to a 24-7 victory over last year's second-place finisher Rico, who just couldn't find his offensive rhythm against The Beard. Garbage played a one-score game against Levi where field goals banged back and forth, ultimately winning the kicking contest 9-3. I played a really close game against Orenga, but came up just short, losing 24-17 as the Eagles and the Ultimate Weapon put up more than the Rams could muster. In the final game of the round, Josh H. won the toss and blew it up, calling a Buffalo-Giants matchup. 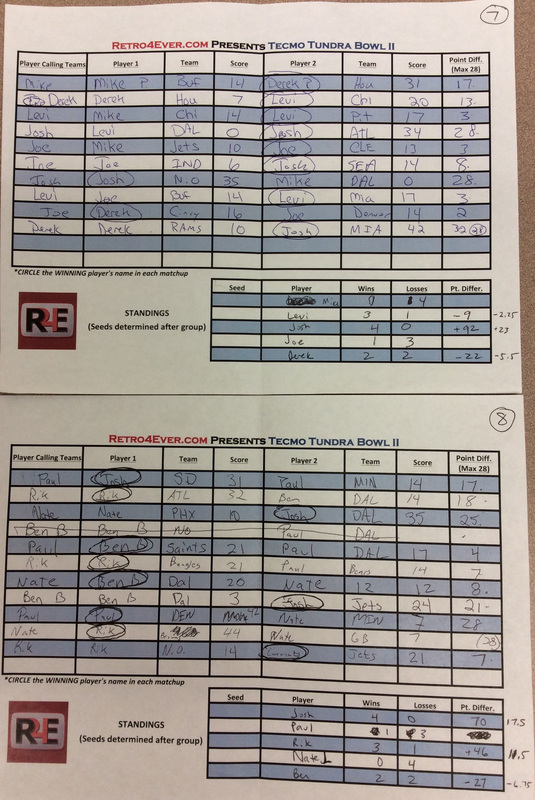 A great game throughout, Tundra Bowl I Champion Josh managed to move on with a close 17-14 victory over the Rikster. Troy and Rico faced off in the Loser's Bracket, looking to claw their way back up. Troy ended up winning the battle between friends, 20-13, eliminating Rico from the tournament. Rikster beat Lucas in 28-14, and I won a close game against HBK, 28-21. Will managed to best Levi by the score of 28-7, eliminating the Green Bay native. These victories would then solidify our final eight participants for the Elite Eight: The Beard, Garbage, Orenga, Josh H., PrimeTime, Will, the Rikster and myself. You'd be hard pressed to find a tournament with more talent in the final eight outside of Madison. In the Winner's Bracket, The Beard and Garbage faced off in a Chargers-Broncos matchup that found Jeff taking the Chargers. A tough battle throughout, Jeff ended up holding off Adam in the end, winning 19-13. Orenga went to take on Tundra Bowl I Champion Josh, and surprisingly came away with a very decisive victory, winning 28-10. In the Loser's Bracket, Troy dominated Will, winning 42-14, while I found myself on the short end of the stick, losing to the Rikster 23-14. I was within a score when I dropped back for a 4th quarter JJ opportunity, failing to release the ball that managed to give him the safety. It was out of reach then because time had nearly expired. Hopefully a better result will happen next year. This set up a Garbage/Rikster, Troy/Josh H. Loser's Bracket. Adam took Philly over KC, and while he managed to keep it incredibly close once again, he fell short, losing 24-21, ending his day. PrimeTime kept it rolling with a dominating effort against Josh, eliminating the former champion 40-7. 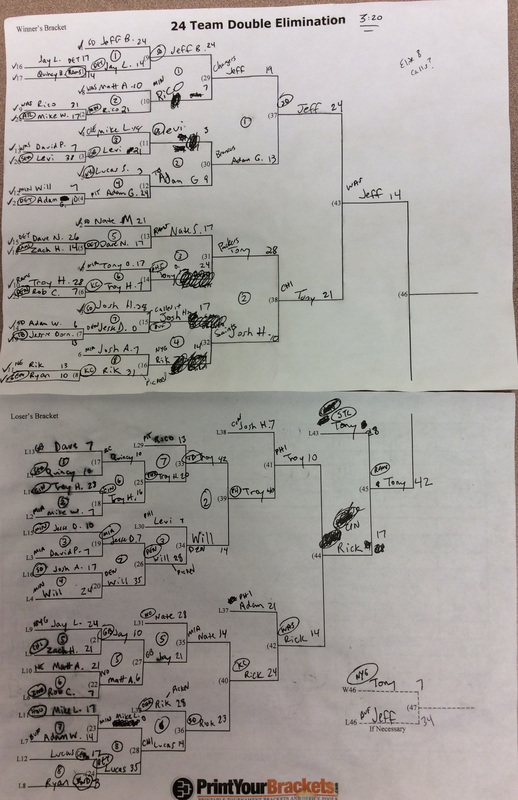 Tony and Jeff faced off in the semifinals, hoping to secure a Championship birth. Jeff called a rare Chicago-San Diego matchup, with Orenga taking the superior Chicago team. Again, another close matchup, however the surprising victory went to Jeff, winning 24-21, advancing him to the Tundra Bowl II Championship. This set up a matchup with the Rikster after PrimeTime ran into a wall, losing to Rik by the score of 14-10, Washington over Philly in another rarely called matchup. Tony took fourth place with that elimination, and the next game of Rik and Orenga would determine who would have to settle for third place, while the victor would take on The Beard. Orenga won the toss in his game, and called the Bengals-Rams matchup. While managing to secure a couple first half scores, Rik couldn't keep the pace up with the Rams, losing 28-17 and taking third place in the tournament in a great showing. The Championship would be Orenga versus Jeff, with Tony having to beat the latter twice to secure the title. The first matchup, called by Orenga, was of the Rams-Redskins, with Jeff taking the Redskins. Tony would stay hot with the Rams and dominate in a 42-14 contest. This set up the first sudden death championship in Tundra Bowl history. Orenga would once again win the toss, and call a Giants-Buffalo matchup, with Jeff taking Buffalo. In an event that no one saw happening, it was yet again another blowout, but in the opposite fashion, with The Beard winning 34-7, and securing his first ever Tundra Bowl Championship. Rarely do you see two powerhouse teams in a lopsided affair like that, and if it were played again, it likely would have been much closer. Jeff dominated from start to finish, and one can only wonder what role the lack of The Posse played for Orenga on that day. 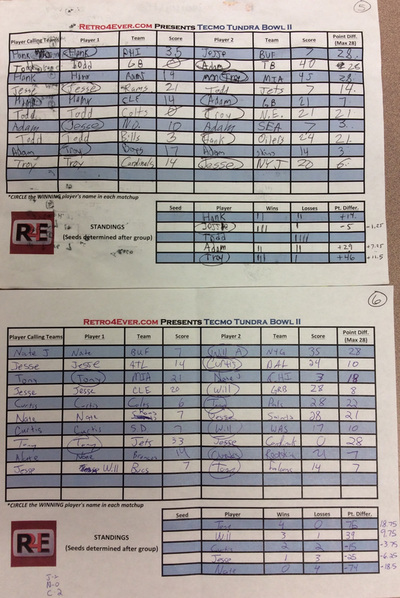 Tundra Bowl II was an even greater success than it was the previous year, and with the large amount of local media coverage, the awareness and player pool only stand to grow. The great atmosphere in lieu of the weather provided just the right concoction of skills, Tecmo Super Bowl, and beer. 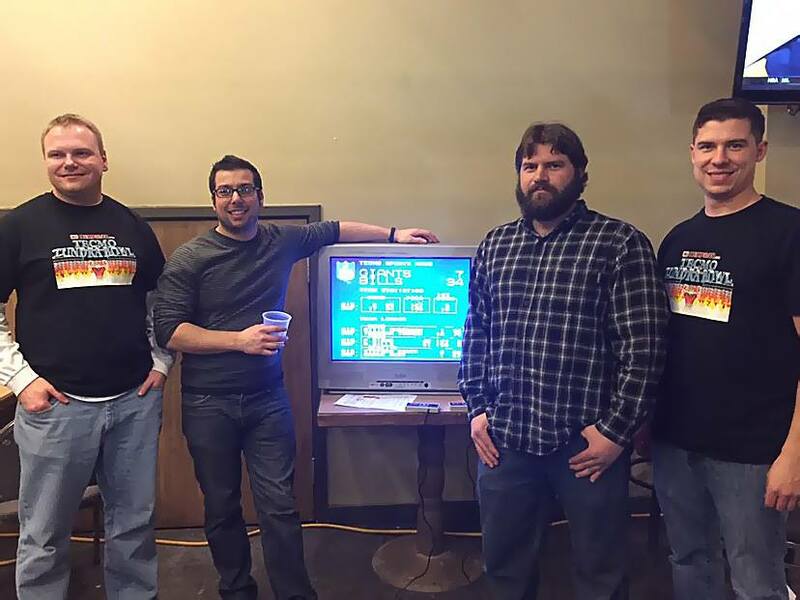 With such powerhouse Tecmo players attending this year's event, it is starting to gain traction as the place to be in the Tecmo community outside of the annual Madison tournament.